culmination with Centennial Gala held at the Washington Club on June 18, many attended in period attire. May 2002: First Lady Laura Bush accepts Honorary Member status in DCLA for 2002-2003. July 2002: Membership year starts July 1 not Sept. 1 per Bylaws change. April 7, 2003: Mrs. Laura Bush has National Library Week kick-off reception at White House for DCLA children's librarians. June 1, 2004: Mr. Bob Woodward of the Washington Post is the featured guest speaker at DCLA's 125th Anniversary Banquet. An article on the event is included in American Libraries magazine. 2005: Credit card payments are first accepted using PayPal on http://www.dcla.org to pay for programs and to charge 2005-2006 memberships. 2005: The Strategic Plan is revised and presented to the board. 2005: First Lady Laura Bush accepts her fourth honorary annual membership in DCLA. 2005: Frank Kurt Cylke receives the Newel Perry Award from the National Federation for the Blind. 2005: Richard Huffine receives the Member of the Year award from the DC Chapter of the Special Library Association. 2005: Bill Turner is elected to serve a two-year term as an ALA Council Representative to the Planning and Budget Assembly. 2005: DCLA's website debuts at the Fall Members Reception. 2006: DCLA's newsletter, Intercom, is offered for the first time in paper and electronic formats. 2006: Roberta Stevens is elected to serve on the ALA Executive Board. 2006: Noted journalist Helen Thomas is the guest speaker at the annual DCLA banquet. 2006: John D. Byrum receives the Melvil Dewey Medal, ALA's award for distinguished service to the profession of librarianship. 2006: Henriette Avram, a pioneer of library automation and leader of the MARC pilot project that led to the MARC format, passes away. 2006: DCLA members join hundreds of ALA members in two days of service projects on behalf of New Orleans libraries struck by Hurricane Katrina. 2006: Ruth Fine Memorial Student Loans increase to three awards per year. The first award was made in 2002. 2006: DCLA takes the lead in developing local library projects for volunteer service during the 2007 ALA Annual Conference held at the Washington Convention Center. 2007: DCLA along with Catholic University and District of Columbia Public Schools wins a significant grant from the Institute of Museum and Library Services to support MLS education for school librarians in the DC system. 2007: DCLA holds a membership contest for a new name for its newsletter. Capital Librarian is selected and the publication moves to a bimonthly schedule. 2007 : Megan Sheils is named to participate in ALA's Emerging Leaders Program. 2008: Camila Alire, PhD, ALA's incoming President-Elect, is the guest speaker at DCLA's annual banquet. 2008: Joint Spring Workshop celebrates its 40th anniversary of delivering continuing education through one-day workshops co-sponsored by DCLA and two other local library associations. 2009: DCLA celebrates 115 years of service to the library community, 1894-2009. 2009: DCLA launches its redesigned website, providing on-line payment for membership and events and a Members Only area. 2009: Roberta Stevens declares her candidacy for the ALA presidency and wins. 2012: The new 2012-2014 DCLA Strategic Plan is adopted. 2013: Beacher Wiggins is named the recipient of the Melvil Dewey Medal, ALA's highest award for distinguished service to the profession of librarianship. 2013: Christina Bailey and Ana Elisa de Campos Salles are selected to participate in ALA's Emerging Leaders Program. 2013: DCLA establishes a bundled membership allowing members to join ALA and DCLA in single transaction. 2013: DCLA website is redesigned by members of a Catholic University LIS class and the winning design is introduced at the annual banquet. 2013: DCLA introduces a new award for members to honor leadership service to the association, the Elizabeth W. Stone Award. 2013: DCLA initiates reciprocal member privileges for Virginia Library Association members to participate in one another's events and conferences at membership rates. DCLA confirmed its reciprocal agreement with the Maryland Library Association. 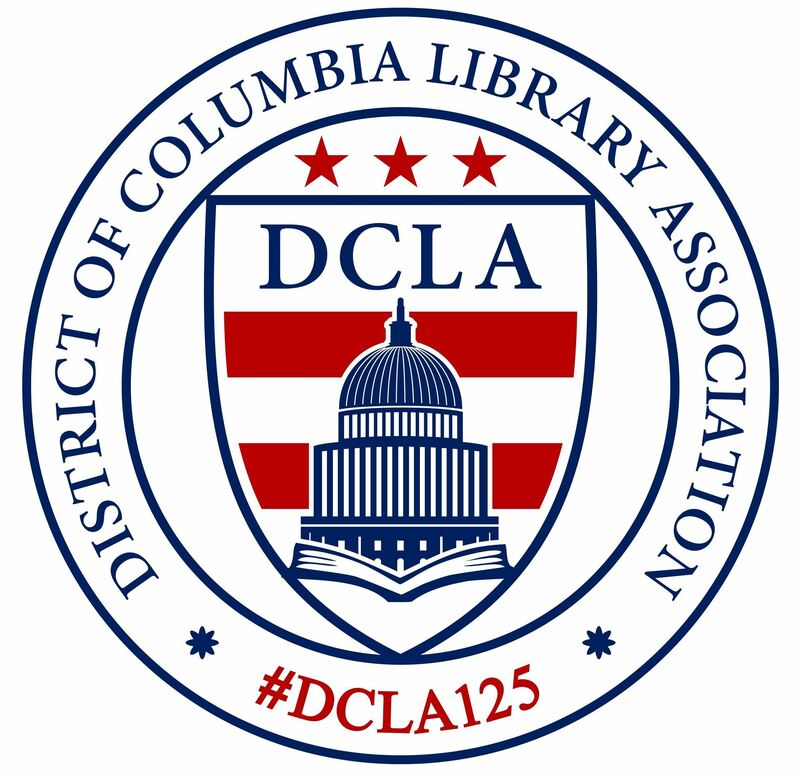 The device of the District of Columbia Library Association, adopted in 1965, is based on the George Washington family shield as adapted by James Thackara and John Vallance and first imprinted on a map of the City of Washington engraved in 1792. The device, as illustrated above, was reproduced from a copy of the map located in the Map Division, Library of Congress. 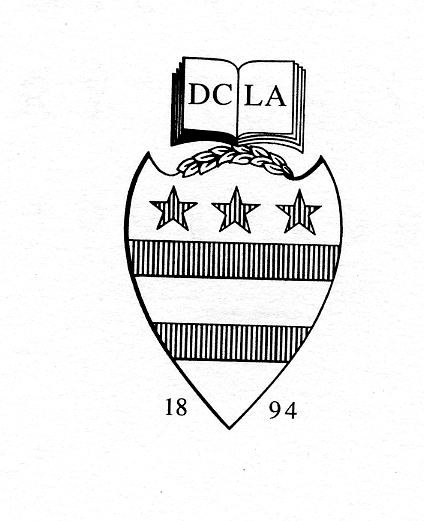 From the purpose of the Association the shield and book were redrawn to secure better definition of the line; "Rights of Man" was replaced by "DCLA"; and at the base of the shield was added "1894", the date of the founding of the District of Columbia Library Association.